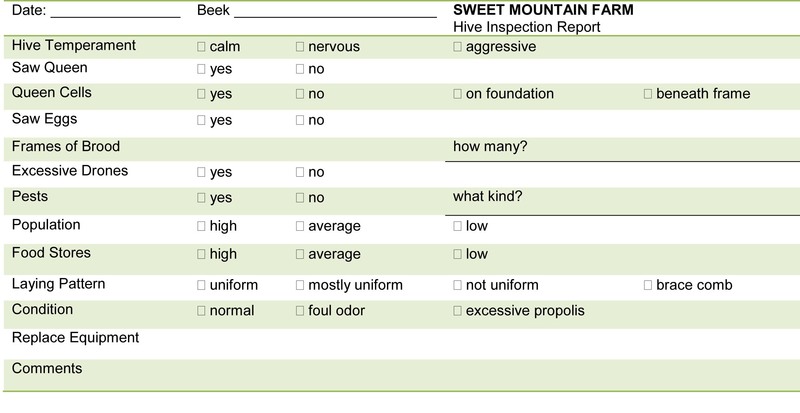 Here is an example of a SMF Inspection Report. One sheet of paper is used for each hive for the entire season. The static information is at the top of the page. A colony is inspected every 10 days. During the beekeeping year, from Mid May until Mid November, the colonies are inspected approximately 7 times. The following information is recorded at each inspection. Colony Inspections – There’s an APP for that! Beekeeping software is quickly becoming a great tool in the bee yard. Try out the free version of HiveTracks. The software continues to impress us with frequent enhancements and usefulness. It is especially great for quickly uncovering trends within a colony allowing proactive and preventative responses. The professional version will track inventory as well as distinguish between 8 frame and 10 frame equipment. Colony Inspection – How often do you get stung?